Will Rs 200 Currency Notes Not To Be Circulated Through ATMs? New Delhi, 5 July 2017: The Reserve Bank of India (RBI) has recently placed an order to print new Rs 200 note in India. The launch of the new denomination note will surely help to fill the huge demand for cash across the nation. It has been reported that the RBI may not allow ATMs to dispense new Rs 200 note once they are in circulation. As per media reports, RBI plans to circulate new Rs 200 currency notes only through banks and not ATMs like Rs 50 and Rs 10 notes are circulated. The Reserve Bank of India (RBI) has now proposed to circulate the new Rs 200 banknotes only through bank branches, similar to the way Rs 50 and Rs 10 notes are circulated, a report by Hindustan Times said. It further quoted a senior banking official admitted recalibrating India’s 220,000 machines to enable ATMs for dispensing Rs 200 notes, will take more than a month. The report also informed that the process of printing the new Rs 200 notes is likely to begin in the months of July. The move is aimed at avoiding another chaotic recalibration process similar to the one that followed after the demonetisation of old Rs 500 and Rs 1000 banknotes in November last year. It is believed that Rs 200 notes will significantly ease day-to-day transactions as people will be able to withdraw lower denomination notes as they are forced to withdraw Rs 500 notes in most ATMs. Post demonetisation, nearly 90 percent of the 2 lakh ATMs deployed across India were re-calibrated to dispense the new 500 and 2,000 rupee notes. The Rs 200 note is the fourth new note to be announced after Prime Minister Narendra Modi made the demonetization announcement and scrapped Rs 1,000 and Rs. 500 notes. 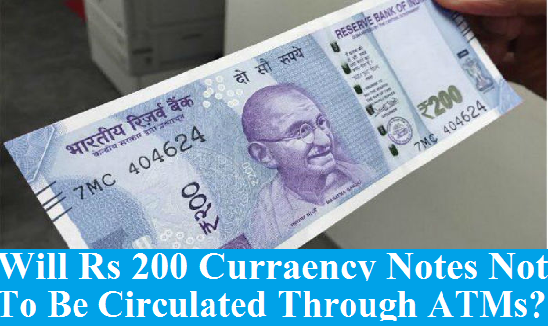 The other three denomination notes that have been approved for circulation so far are Rs 1 note, Rs 500 and Rs 2000 notes. The introduction of lower denomination notes comes against the backdrop of the government’s move to rework the currency mix. RBI has taken the decision to introduce Rs. 200 notes with the consultation of Finance Ministry in March and aims to further improve the current situation of lower denomination notes in the country. Param News: Central Government Employee News|Latest DOPT OM: Will Rs 200 Currency Notes Not To Be Circulated Through ATMs? Will Rs 200 Currency Notes Not To Be Circulated Through ATMs? The Reserve Bank of India (RBI) has recently placed an order to print new Rs 200 note in India. The launch of the new denomination note will surely help to fill the huge demand for cash across the nation.